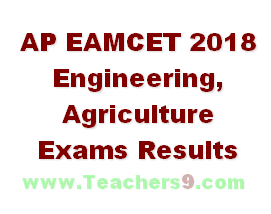 AP EAMCET Results 2018 – Check AP Engineering/ Agriculture Rank Card, Cutoff Marks 2018 : Download AP EAMCET Engineering Result/ EAMCET Agriculture Rank Card, Cutoff Marks AP EAMCET Results 2018 will be published on 2nd May 2018 (Engineering & Agriculture). Jawaharlal Nehru Technological University (JNTU), Kakinada organizes the AP EAMCET exam on the behalf of APSCHE. AP EAMCET 2018 Results Download For Engineering & Medical With Cutoff Marks. AP EAMCET Result will also update sche.ap.gov.in, manabadi.com, and vidyavision.com, schools9.com websites. The Official Result for Andhra Pradesh engineering, agriculture and medical common entrance test (AP EAMCET) 2018 will be release on 2nd, May 2018 at http://sche.ap.gov.in.